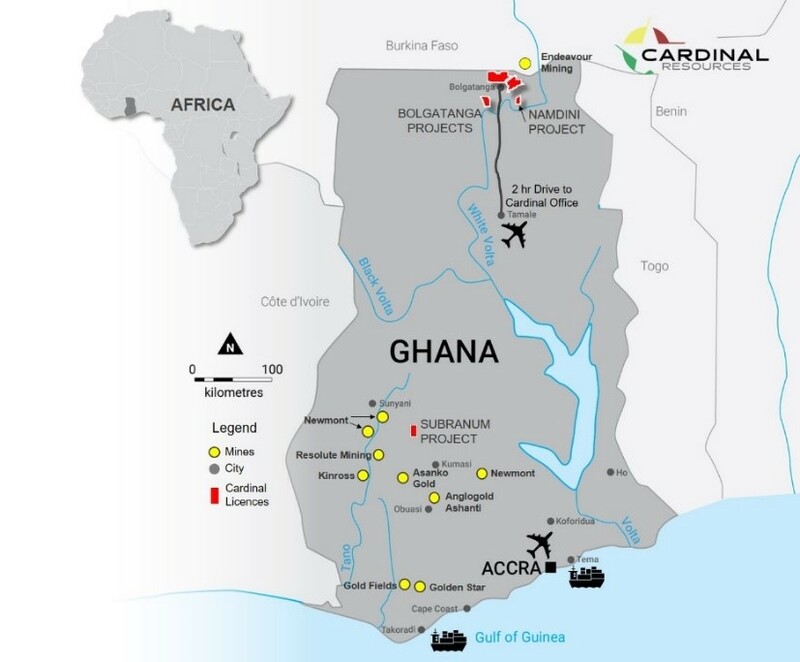 Cardinal is the beneficial owner of 2 gold exploration assets, the Bolgatanga Project area and the Subranum Project comprising circa 734 km² of granted tenements. The Bolgatanga Project is located in a Paleoproterozoic granite-greenstone belt in north east Ghana close to the border with Burkina Faso. The Subranum Project is situated in the south western portion of the country, also within a Paleoproterozoic granite-greenstone belt. 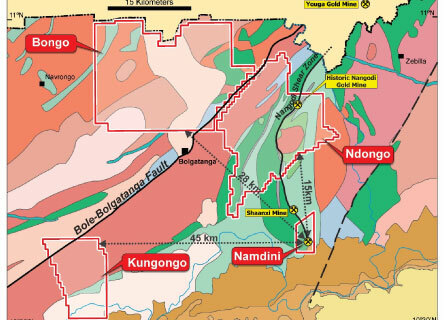 Gold mineralisation in Ghana and along strike in Burkina Faso is principally located within the greenstone belts. There is significant production from a number of gold mines in both regions, as well as from numerous small artisanal workings. The Bolgatanga Project area is located within a series of highly prospective granite-greenstone belts, being the Bole-Nangodi belts. 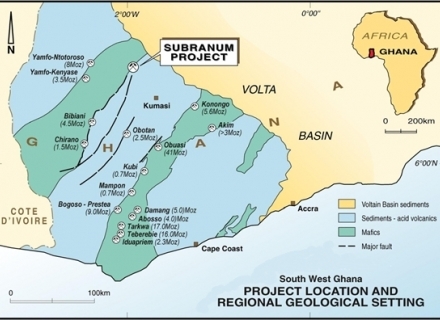 Similarly, the Subranum project is hosted within the Sefwi-Bibiani granite-greenstone belt. The belts are a north east extension to the Paleoproterozoic aged Birimian basins that formed during the collision between the West African and Guyana Archean Shields. Ghana has a low sovereign risk rating and has enjoyed over 20 years of continuous democratic rule. It is one of the most developed and affluent countries in Africa, with a well-developed Mining Code, infrastructure and a population with the technical skills to support modern mining projects. Political stability in Ghana has made the country one of the most attractive new mining investment areas in Africa. After South Africa, Ghana is Africa’s second-largest gold producer. Large industry players such as Newmont Mining Corporation, AngloGold Ashanti and Kinross, have been joined by smaller companies including Randgold Resources, Keegan Resources, Golden Star Resources, PMI Gold Corp, Perseus Mining, Azumah Resources and African Gold Group, as well as individual and local artisanal miners. Many industry participants see potential for the discovery of further significant deposits in Ghana as large parts of the country, particularly in the north east region, remain relatively under-explored.